At the heart of Cornell's success is the generous support of our alumni, parents and friends. Your gifts support everything from student scholarships to faculty research; from new lab equipment to off-campus course offerings. Choose the method that allows you to impact Cornell most conveniently. Visit my.cornellcollege.edu/give to make your gift online. Visit my.cornellcollege.edu/sustain to become a Sustaining Partner. Call us at (319) 895-4248 or toll-free at (877) 683-7666. Double or even triple your gift's impact on Cornell! Thousands of companies offer a match for their employees' charitable giving. Best of all, you are recognized for the full amount of your own gift plus any resulting corporate match. Find out if your employer matches charitable donations. For many, a stock portfolio is one of their most valuable assets, and one that can carry substantial appreciation over time. A charitable contribution of appreciated securities that you have held for more than one year is simple and entitles you to a double tax benefit: you receive a charitable deduction for the full current market value of the stock, and you avoid the capital gains tax on the appreciation. Find instructions for transferring securities to Cornell [pdf]. Securities: Give shares of appreciated stock, mutual funds, bonds, and other investment instruments. Click here for instructions on transferring securities to Cornell [pdf]. Real Estate and Personal Property: Donate a home, farmland, antiques, and other valuable property in your estate. Retirement Assets: Give IRA, 401(k), and other retirement assets to maximize your funds and avoid tax penalties. Life Insurance: Make Cornell the owner and or beneficiary of your life insurance policy. Will: Factor us into your estate plan to ensure Cornell's financial future for generations to come. Gifts to the Cornell Annual Fund help sustain a transformative liberal arts education for students at Cornell College. Your support bridges the gap between tuition and the total cost of educating students, and ensures excellence in the Cornell experience. Gifts to endowment and capital improvements strengthen the Hilltop for the future. Planned giving options deliver financial benefits and support the college in ways you never dreamed possible. Cornell College was founded in 1853 by George Bryant Bowman, a Methodist minister from North Carolina with a passionate belief in higher education. Bowman was aided by a group of prominent Mount Vernon citizens who wished to provide educational opportunities for their children beyond the one-room schools that operated for no more than a few months each year. Originally known as the Iowa Conference Seminary, the school was renamed in 1857 after William Wesley Cornell, a prosperous merchant and devout Methodist whose distant cousin, Ezra Cornell, founded Cornell University a decade later. Today, Cornell College maintains an affiliation with the United Methodist Church, and the college welcomes people from all religious traditions and from all non-religious perspectives. William Fletcher King became president in 1863 and served for 45 years, one of the longest presidencies in the history of American higher education. The college was among the first to recognize the science of education in 1872, when it began offering education courses. Sociology was added to the curriculum in 1899, only six years after the University of Chicago established the first academic department of sociology in the United States. 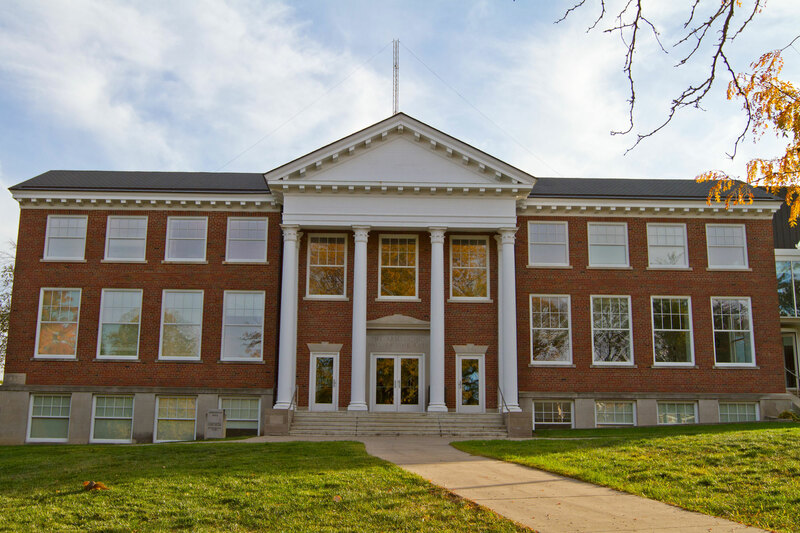 Cornell's department of geology is the oldest in Iowa, with course offerings dating to 1855. Along with its commitment to the preservation of the best of the old, Cornell has been willing to adopt innovative changes. One-hundred-twenty-five years after its founding but in the same pioneering spirit, in 1978 Cornell faculty adopted the block plan, or One Course At A Time, an academic calendar in which students devote themselves to just one subject for three-and-a-half-week course terms. Today, Cornell College is a thriving liberal arts institution firmly ensconced on several influential “best colleges” lists. Students here choose from more than 40 academic majors and pre-professional programs, or design their own major. In small classes, Cornellians immerse themselves in the exploration of knowledge and understanding—one course at a time. The Rock. This 5,000-pound granite boulder has been relocated, painted, burned, buried, and a lot more since first coming to campus in 1889. Today, the Rock is fair game for anyone with a can of paint. The Orange Carpet. Part gathering space, part performance arena, part communications vehicle, this patch of vibrant floor covering has been a campus landmark in the Thomas Commons since 1966. Toilet Paper Toss. Cornell’s rivalry with Coe College in Cedar Rapids, the oldest athletic rivalry west of the Mississippi, has led to a few interesting traditions. For instance: each year, Rams fans celebrate the men’s basketball team’s first home basket of the year against Coe by filling the court with toilet paper streamers. Move-in Day. Each fall, the Cornell football team and student leaders gather to help new students move in to the residence halls—and to welcome them to campus. Culture Show. Cornell's international student group Eyes of the World organizes this wildly-popular annual variety show featuring songs, dances, fashion, and various talents from around the globe. Relay For Life. Cornell students annually lead this overnight event that raises tens of thousands in the fight against cancer. Their efforts have earned national recognition in recent years for per capita donations. Student Symposium. This day-long event on the Orange Carpet provides a showcase for the academic work of Cornell students in the form of poster presentations, lectures, and performances. Late-night Breakfast. To help students fortify themselves for the final dash towards finals, Cornell staff serve them heaping stacks of pancakes and other breakfast goodies late at night several times a year. Cornell T. Moose. Okay, it’s actually a moose’s head, and it’s stuffed—but it dates from 1925 and it’s part of the family. The moose, which presides over a student lounge in Law Hall, has been known to receive postcards from admirers. Ginkgo tree. When Cornell was founded, this magnificent tree—now the state's largest ginkgo—already graced the Hilltop. The tree is a majestic backdrop for gatherings on the President's lawn, and legend has it that female students may see the image of their beloved in the mirror while brushing their hair beneath its boughs on a moonlit night. Commencement. Cornellians cross a stage to collect their diplomas just like other grads. But instead of going alphabetically, they arrange themselves with groups of friends. And during the Baccalaureate service, they honor their four-years on campus with a litany of gratitudes. More? New traditions in the making include Moonlight Cafe, painting the kiosks, Get Outta Town adventures, disc golf at lunch time, Pet Therapy Day, and Purple Wednesdays.